These fabulous quilts were on display in Brouage on my recent trip to France. A plaza in Nantes. At the time not sure what was ordered as I don't read French. How ever what came was a choc muffin when cut open oozed chocolate served with coffee ice-cream. Thought I had died and gone to heaven. I dug this yummy quilt out of the cupboard yesterday. When I first bought the friendship blocks there were not sewn as a quilt top and were very uneven I unpicked everything and resized all the pieces and hand stitched it all back together into the top you see in the top photo. I have also hand quilted. 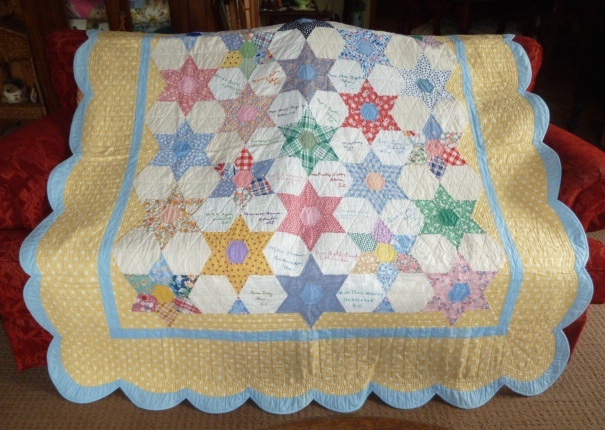 The blocks were originally hand pieced in the 1940's by a group of women in North and South Carolina. Many of whom embroidered their names.